There are two kinds of blogs: Those that reflect, opine, or ponder on the news and events of the day, and those that go blah blah blah. I like to think my blog does both. My latest reflection: How does a woman reach a certain age, mother children, hold down a job and keep her car reasonably well maintained and still manage to find herself with only two forks in the household? 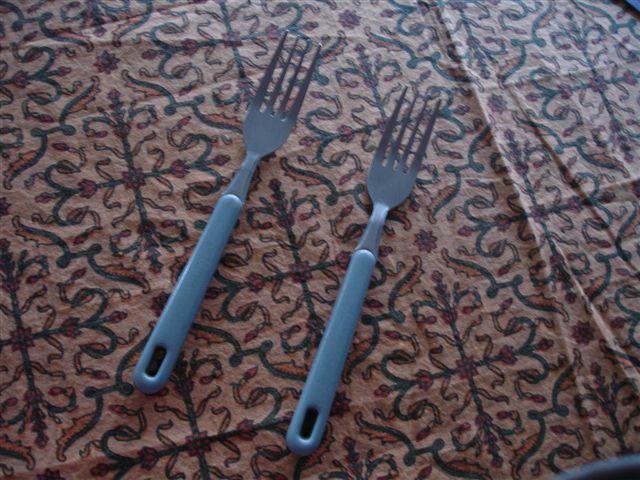 Two forks. One. Two. When last month I had maybe a dozen forks of various makes and vintage, a week ago I opened the drawer to find only two still in existence. None in the sink. None on the counter. None in the fridge (don’t ask). None misplaced in any other likely drawer. Being a mother, I started a secondary search: Under the couches, out in the garden, under the beds. A physical body search of the children yielded nothing. I had two forks in my household. There are three people living here. Right away you can see the problem. The morning I realized I had only two forks, my daughter had a playdate spend the night. The next morning I made pancakes. My daughter, her friend, and my son, sat down to eat. “I don’t have a fork,” said my son. I quickly realized my dilemma. I searched my utensil drawer for something else. A creative plan B. They say the ability to use tools is what separates us from the lower animals. “How about chopsticks?” I offered. Hungry seven-year-old boys generally don’t have the best sense of humor. I dug around some more. deep in the drawer I found a baby fork. It was tiny. It had a green plastic handle with a little dog on it. But it was a fork. I held it out to my son, who appeared to consider it briefly. Until the two older girls snickered. I told the boy he’d just have to wait until one of the girls finished her breakfast, and he left the room with a look of profound insult. The girls proceeded to savor their pancakes at great length, and when they were done, the third pancake was cold. That night I told Tony about my two forks, and he got up without another word (he did shake his head a little) and drove to Target to buy me two sets of new flatware. I now have many forks. I still can’t cook very well. I see the “fork gremlin” travels the neighborhood… One of my best Christmas gifts was when my husband went on the internet and filled in the missing flatware- of course it was mostly forks! You mean blah, blah blog. Kim: Excited?? Where’s my all-Expo pass?? ..(still shaking head) well, uh, now that your tableware has been replaced, no more shilly-shallying!! I’m ready to try some new recipes BHC!